You Already Have Debt. Why Create More? You know you’ve done it—gone shopping when you can barely afford your phone bill, upgraded your vacation package even though you could use some extra gas money, dreamed of becoming rich even while handing the cashier your credit card. In this book, you will not learn a “get rich quick” scheme. You will not receive a code on the last page that guarantees you a spot in tonight’s lottery, or the key to reverse your debt overnight. However, you will learn how to make what you already have—no matter how much you have—go further, so that you can achieve your personal and financial goals one by one. Within these pages, you will learn how to incorporate conscious spending habits into your everyday routine. Get more for less by shopping online before shopping in stores; look beautiful and feel beautiful without spending much at all. Learn how to juggle education expenses while still taking time for yourself: body, mind, and soul. 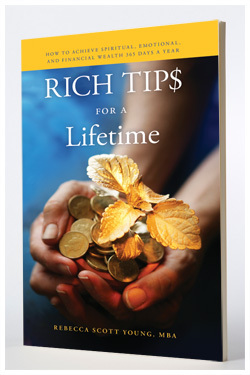 Written by investment adviser Rebecca Scott Young, Rich Tips for a Lifetime will help you take control of your financial future so that you can avoid the common mistakes Young has seen her clients make time and time again. Nourish your financial health today, and you can be on your way to a financially fit tomorrow! Please visit www.YoungEyeConsulting.com to see other available services, like: mentor-coaching, financial services, and strategic intervention.